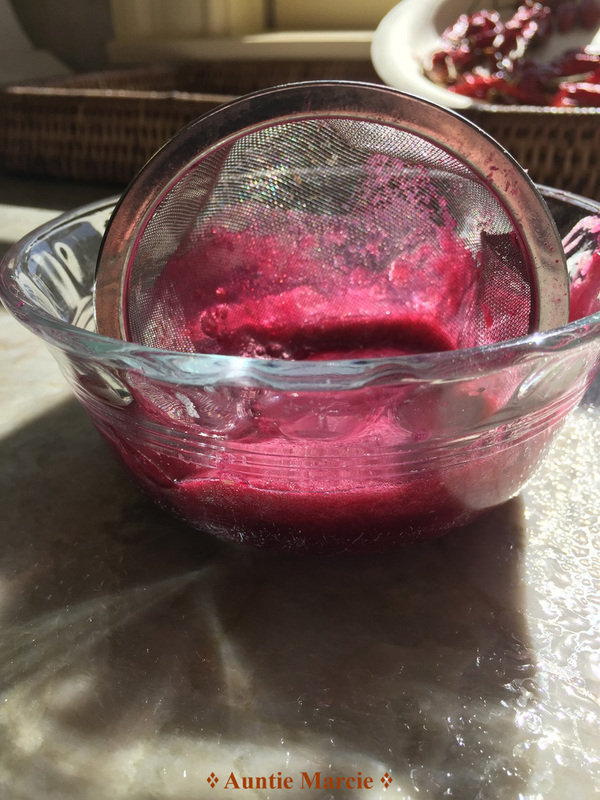 Thawing from my freezer, I mix fraise du bois, strawberries, blueberries, raspberries… I skip blackberries because they are tasteless and I won’t share my precious soil and water with them! Back to boysenberries. There are thornless varieties now and I try to be exclusive to them, but I do have the original full of thorns variety growing as well. I plant them on every terrace wall in my garden. I get great crops every year. This year I bought a handmade stainless steel double burner super-sized home canner which makes canning so easy and fast. I put half the berries through a food mill strainer to remove seeds. Berry jam with all the seeds is just way to ‘seedy’. I always remove half. I have an electric mill (Omra) and a hand crank mill (Squeezo). They both work great for this purpose. I harvest, clean and freeze them. After freezing I shrink wrap them and save them all ‘till end of season. Then I take out all the frozen packages and make the jam. I wish I could say my jam is award winning. One year I sent some in to the Pomona Fair but I did not get a mention. Kudos from friends and family are award enough. My daughter featured my jams at her wedding as her give away gift. Everyone begs and begs for more and more. WHY ARE AUNTIE MARCIE’S JAMS SO DELICIOUS AND ADDICTIVE? The secret is sweet/tart. Most recipes and most jams are just too sweet. Mine are sweet/tart, more like a pie filling than a supermarket jam. Prepare glass jars for water bath canning. Prepare water bath. 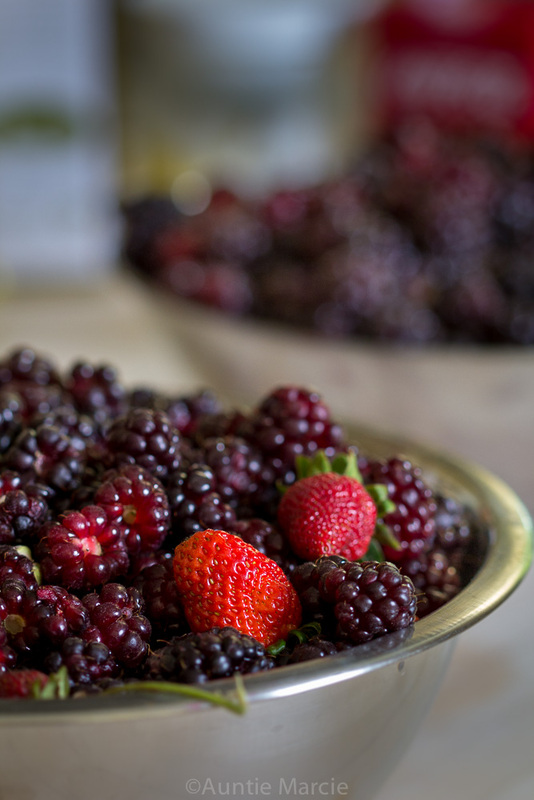 Remove seeds from half your berries*. Recombine and measure 12 cups. Pour into jamming pot. Add lemon juice and calcium water. Bring to a boil. Mix sugar and pectin together with wire wisk. Wisk into roiling boiling berries. Boil for a minute or two. Test for gel and for taste. Pour into jars. Leave ¼ inch head space. Wipe rims clean and seal with two piece lid sets. Process for 10 minutes. Cool. Label and don’t forget to add the year. My jams have a two year shelf life. Tips: Use elbow length gloves. Use a ladle and a funnel to pour jam into jars. 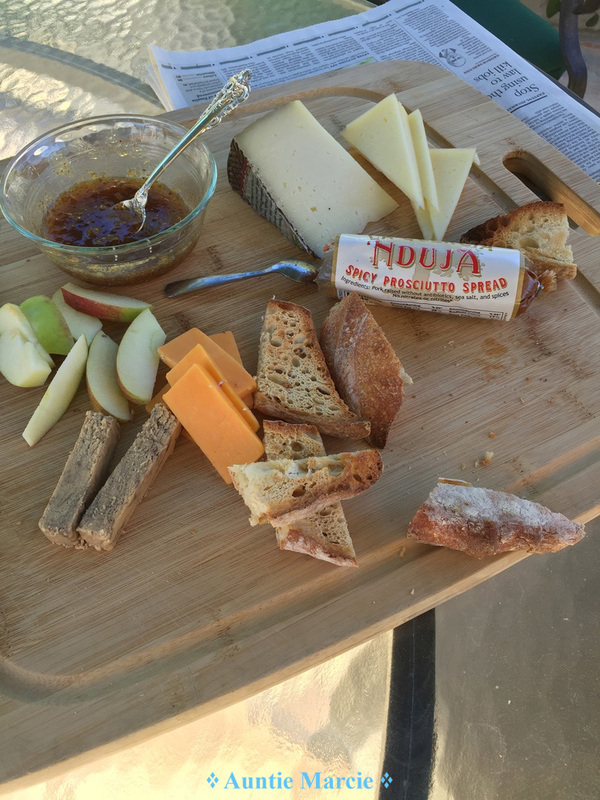 Besides using jam for buttered toast, we use it along with our cheese at appetizer / cocktail hour time, on charcuterie platters, on grilled cheese sandwiches, mixed with marinades for rotisserie chicken, in salad dressings, in jam crostata. Add fresh milled black pepper and reduce some good quality balsamic. Add to jam for use with cheeses, as marinade and grilled cheese sandwiches. Add ½ t. cayenne pepper, or crushed red pepper (we grow ours (picture)or even black pepper. Use for cheese and charcuterie and for grilled cheese sandwiches. We had a bumper Loquat crop this year. They are so delish to eat right off the tree…similar to a lychee nut. So clean and fragrant tasting. Like a super amped up purfumy pear...but even better! Clean loquats and remove the seeds. Throw them all into a pot. Mash and boil until you have a puree. Freeze until crop is harvested. Loquats do not require any pectin! I had 28 cups of puree! So I added two 33 oz. boxes of nectar, 4 cups of sugar, about 2 cups of lemon juice, 1 cup of Muscavado, 1 t. of salt and 1 t. of powdered and crushed spicy red pepper. Uses: jam, baby food (without the peppers!! ), pies, cakes, sauces for fish, especially halibut, marinades, grilled cheese sandwiches, cheese platters…can you come up with some?